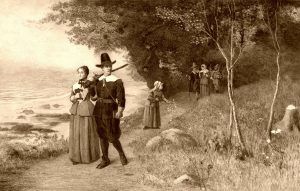 The Pilgrims and Puritans, whose migration to the New World marks the beginning of permanent settlement in New England, were children of the same age as the enterprising and adventurous pioneers of England in Virginia, Bermuda, and the Caribbean. It was the age in which the foundations of the British Empire were being laid in the Western Continent. 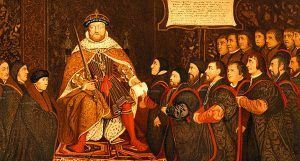 The Kingdom had enjoyed 60 years of domestic peace and prosperity, and Englishmen were eager to share in the advantages which the New World offered to those who would venture there. Both landowning and landholding classes, gentry and tenant farmers alike, were clamoring, the one for an increase of their landed estates, the other for freedom from the feudal restraints which still legally bound them. The expectations of all were aroused by visions of wealth from the El Dorados of the West, or, of profit from commercial enterprises which appealed to the capitalists and led to investments that promised speedy and ample returns. A desire to improve social conditions and to solve the problem of the poor and the vagrant, which had become acute since the dissolution of the monasteries, was arousing the authorities to deal with the poor and to dispose of the criminal in such a way as to yield a profitable service to the kingdom. England was full of resolute men, sea-dogs, and soldiers of fortune, captains on the land as well as the sea, who in times of peace were seeking employment and profit and who needed an outlet for their energies. Some of these continued in the service of kings and princes in Europe; others conducted enterprises against the Spaniards in the West Indies and along the Spanish Main; while still others, such as John Smith and Miles Standish, became pioneers in the work of English colonization. But, more important than the promptings of land-hunger and the desire for wealth and adventure was the call made by a social and religious movement which was but a phase of the general restlessness and popular discontent. The Reformation, in which this movement had its origin, was more than a revolt from the organization and doctrines of the medieval church; it voiced the yearning of the middle classes for a position commensurate with their growing prominence in the national life. Though the feudal tenantry, given over to agriculture and bound by the conventions of feudal law, were still perpetuating many of the old customs, and the towns were working to emancipate themselves from feudal control. The gild, a closely compacted brotherhood, existing partly for religious and educational purposes and partly, for the control of handicrafts and the exchange of goods, became the center of middle-class energy. 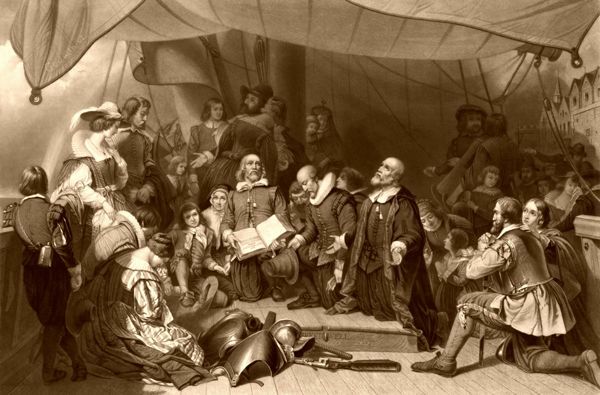 Thus, it was largely from those who knew no wider world than the fields which they cultivated and the gilds which governed, that the early settlers of New England were recruited. Equally important with the social changes, were those which concerned men’s faith and religious organization. The Peace of Augsburg, which, in 1555, had closed for the moment the warfare resulting from the Reformation, not only recognized the right of Protestantism to exist but also handed over to each state, full power to control the creed within its borders. Whoever ruled the state could determine the religion of his subjects, a dictum which denied the right of individuals or groups to depart from the established faith. Hence arose a second revolt, not against the medieval church and empire but against the authority of the state and its creed, whether Roman Catholic, Anglican, Lutheran, or Calvinist, a revolt in which the Huguenots in France battled for their right to believe as they wished, and the Puritans in England refused to conform to a manner of worship which retained much of the medieval rituals and ceremonies. Leaders demanded radical changes in faith and practice and advocated complete separation from the Anglican Church and isolation from the religious world about them. Of such were the Separatists, who rejected the Anglican and other creeds, severed all bonds with a national church system, cast aside form, ceremony, and a hierarchy of church orders, and sought for the true faith and form of worship in the Word of God. For these men, the Bible was the only test of religious truth. The Separatists organized themselves into small religious groups, as independent communities or companies of Christians, covenanted with God and keeping the Divine Law in a Holy Communion. They consisted in the main of men and women in the humbler walks of life — artisans, tenant farmers, with some middle-class gentry. Sufficient to themselves and knit together in the fashion of a gild or brotherhood, they believed in a church system of the simplest form and followed the Bible, Old and New Testaments alike, as the guide of their lives. Desiring to withdraw from the world as it was that they might commune together in direct relations with God, they accepted persecution as the test of their faith and welcomed hardship, banishment, and even death as proofs of righteousness and truth. Convinced of the scriptural soundness of what they believed and what they practiced, and confident of salvation through unyielding submission to God’s will as they interpreted it, they became conspicuous because of their radical thought and peculiar forms of worship, and inevitably drew upon themselves the attention of the authorities, both secular and ecclesiastical. But, Amsterdam proved a disappointing refuge. In 1609 they moved to Leyden, where for 11 years, they remained, pursuing such trades as they could, chiefly weaving and the manufacture of cloth under the leadership of John Robinson and William Brewster. But, at last, new and imperative reasons arose, demanding a third removal, not to another city in Holland, but, this time to the New World called America. 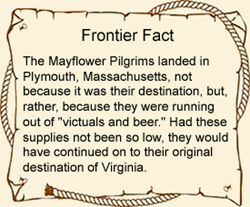 Embarkation of the Pilgrims for America. 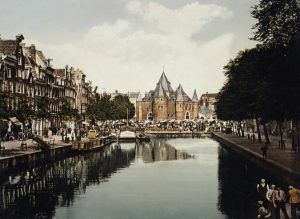 They were breaking under the great labor and hard fare; they feared to lose their language and saw no opportunity to educate their children; they disapproved of the lax Dutch observance of Sunday and saw in the temptations of the place, a menace to the habits and morals of the younger members of the flock, and, in the influences of the world around them, a danger to the purity of their creed and their practice. They determined to go to a new country where they might keep their names, their faith, and their nationality.